A few thoughts on the Arsenal 3 Milan 0 Champions League match | "It's all about the Arsenal"
Finally home after a busy, but stress free day at work. Proper matchday nosebag served up by her indoors. Sausage, mash & onions in beef graaaaaaavy… Essex boys love graaaaaaavy!!!! Twitter is currently MENTAL with Arsenal fans showing belief that the team can do it tonight. That’s the spirit Gooners… COYR’s…. For my TV viewing pleasure tonight I am sharing it with Geoff Stelling. Ruud Guillit, Graham Souness and Alan “Smudger” Smith. Commentators Rob Hawthorne and Gary Neville (who was right behind Arsenal tonight) – Teams are in the Tunnel… Here come the teams…. Come on your Reds, show the fighting spirit of the last few league games. 3 good move between RVP- TR7 and TW14 ends with TW14 just offside. 5 Van Bummell booked for trip on TR7. He has to be careful now. Corner!!! Another Corner!!! 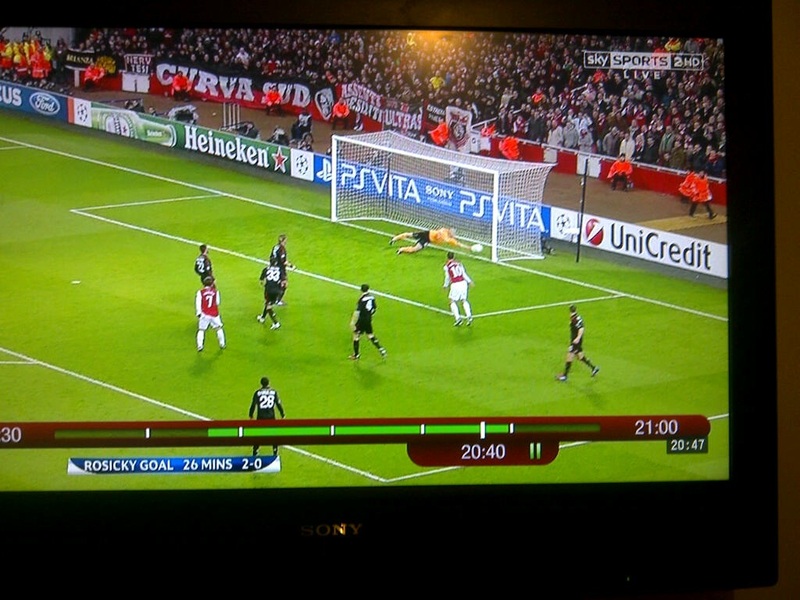 9 Theo on to RVP in area and RVP shoots with right, Oooooooooooooooooo that was close… Saved by Abbiati. 14 Gibbs sloppy, loses the ball and another booking. (someone is going off tonight) Free kick Milan comes to nothing. 16 What a chance but RVP and Rosicky mess it up between them. 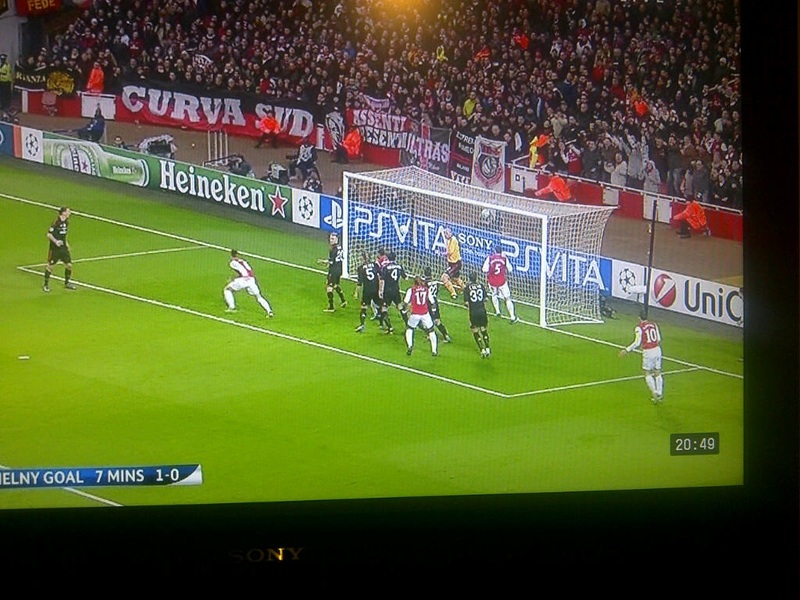 18 Gervinho to RVP and a superb shot saved by Abiatti. Corner Arsenal… Another corner Arsenal, both come to nothing. Hawthorne will you shut the F**k up trying to talk Milan into scoring. We know what the permutations are. Rosicky is playing really well. 36 Gone a bit flat. Maybe not a bad thing for a while. 45 Pheeeeeeeeeeew!!! That was close… . El Shaarawy all alone inside the box but he could not hit cows arse with a banjo and hits it wide. 54 Theo drives in and gets a corner. Comes to nothing. 55 Song booked and Milan waste free kick high, wide and handsome. What a MISS Gervinho drives into the area shoots and the Milan defender, deflects the ball to the keeper to save by Abbaiti and then of all people a sitter by RVP, an absolute sitter, missed as he tried to chip the keeper and his arm comes from nowhere to stop it from going into the net… Milan coming back into it. 62 S13 clears the ball, very sloppily almost gives a simple goal to Milan as Ibrahimovic, who from 40 yards shoots and puts it wides of S13’s right hand post, bit of luck there, but S13 deserves that. Ref giving Milan everything and Arsenal nothing. Theo is taken out by van Bummell where for me the Ref played on to save booking van Bummel and having to send him off. 3 mins injury time, you sure? Bloody good effort tonight. I am really proud of the boys, they showed some spirit, some fight and quite a bit of skill to get us 3-0 at half time. Second half Milan were better and gave us very little and had a few chances themselves. Arsenal started to tire and once our twin speed duo Oxo and Theo went off, our chance basically went. When push came to shove Arsenal just did not have any real quality to come on and change things, something that needs correcting in the summer. After comebacks against Villa, Sunderland, Spurs and Liverpool already in 2012, this one was just a bridge too far. Now we have a six-day rest till Newcastle at home and hopefully many of the knocks would have cleared. Watch out Spuds the proper football team from North London is coming up right behind you.